Kibbles 'n Bits Original Savory Beef & Chicken Flavors is a low-priced dog food with overall lower quality. This product has a staggering 14 controversial ingredients which unfortunately also includes artificial preservatives, colors and flavors. The food has a high amount of carbs, compared to the amount of protein and fat, plus a low meat and fat quality. Kibbles 'n Bits has an average number of recalls. Lastly, the company was not very transparent when answering our questions. The food has high carbs and low protein and fat, making it less nutritionally balanced compared to other dog foods we evaluated. Carbohydrates are cheap so they keep the food’s cost low and they are nutritionally useful to dogs in the right amounts. However, high amounts of carbs can reduce the much-needed meat-based protein and fat content. Corn, Soybean Meal, Beef & Bone Meal, Whole Wheat, Animal Fat (BHA Used as Preservative), Corn Syrup, Wheat Middlings, Water Sufficient For Processing, Animal Digest (Source Of Chicken Flavor), Propylene Glycol, Salt, Hydrochloric Acid, Potassium Chloride, Peas, Caramel Color, Sorbic Acid (Used as a Preservative), Choline Chloride, Sodium Carbonate, Minerals (Ferrous Sulfate, Zinc Oxide, Manganous Oxide, Copper sulfate, Calcium Iodate, Sodium Selenite), Vitamins (Vitamin E Supplement, Niacin, D-Calcium Pantothenate, Vitamin a Supplement, Riboflavin Supplement, Thiamine Mononitrate, Vitamin D3 Supplement, Vitamin B12 Supplement, Pyridoxine Hydrochloride, Folic Acid, Biotin), Dl-Methionine, Calcium Sulfate, Carrots, Green Beans, Wheat Flour, Titanium Dioxide (Color), Yellow 5, Yellow 6, Red 40, BHA (Used as a Preservative), Blue 1. The average dog food we reviewed has 39 total ingredients, with 1 controversial ingredient. This product has 14 total controversial ingredients and a surprising 4 of them are found in the first five ingredients. This is very concerning because the first 5 ingredients make up most of the product. Meat and bone meals are created by cooking meat, tissue, bones and slaughterhouse waste products using high heat. In the process, most of the water is removed, resulting in a protein-rich powder. Pure meat meals contain about four times the protein meats do, so generally, they're a good source of nutrients. However, meals that also contain bones can be difficult to digest and have the potential to include rancid, dead, dying, disabled or diseased meat sources. For these reasons, we do not consider this a high-quality ingredient. Whole grain means that all three edible parts of the kernel (bran, germ, and endosperm) are kept before milling, which means more protein and nutrients are in the final product. Wheat is a grass and cereal grain often used in dog food. It provides protein, dietary fiber, manganese, phosphorus, niacin, B vitamins and minerals. Some dogs may develop wheat allergies, though they are a lot less common than allergies to beef, dairy and soy. The jury is still out on whether wheat is a high-quality dog food ingredient so please consult your vet if you suspect your dog may be allergic or has food sensitivities. Grain-alternatives like potatoes, peas and legumes may be linked to canine heart disease (it's too early to say this conclusively), so keep that in mind when buying foods without wheat and other grains. Corn is a lower cost ingredient that does provide energy, but dogs can be sensitive to it. As a kernel it is not digestible, so it must be processed, but that processing leads to a higher glycemic index. Corn is not generally considered a controversial ingredient, but is controversial if it is used in the top five ingredients (which make up about 80% of the food's weight) where a named meat or lean protein would be more nutritious. Wheat is not simply good or bad. It's a lower cost ingredient that does provide energy, but some dogs can have a sensitivity to it. Wheat is not generally considered a controversial ingredient, but is controversial when it is used in the top five ingredients (which make up about 80% of the food's weight) where a named meat or lean protein could be more nutritious. Corn Syrup (also called corn sugar or glucose syrup) is an added sugar made from corn. It enhances the foods flavor to make it more likely your dog will eat. The health concerns of added sugar are as real for dogs as they are for humans, notably obesity and diabetes. Animal digest is produced by chemically breaking down animal tissue into a liquid that can be used as an added flavoring, making it more likely your dog will eat the food. This is a controversial ingredient because it is produced with unknown animal sources which are also often of unknown quality. Because this ingredient says “Chicken Flavor” parts of this seem to be made from chicken, but it doesn’t have to be all of the digest. Used to help retain moisture in food but also used to de-ice aircraft and in automotive antifreeze. it has been shown to contribute to a serious blood disease in cats called Heinz Body Anemia. It has been banned from use in cat food by the FDA, but not in dog food. Extracted from titanium and used in many products like paint, cosmetics, sunscreen and more. For pet food it's used for coloring and texture. It has been identified as possibly cancer-causing in humans - and studies of have found that titanium dioxide nanoparticles can cause an inflammatory response and genetic damage in mice. What's most concerning is that this ingredient is completely unnecessary, dogs simply don't care about the color of their food. Brilliant Blue FCF (also called Blue 1 and E133) is a synthetic dye used to change the color of food. It has been shown to create allergic reactions in individuals with pre-existing moderate asthma. What's most concerning is that this ingredient is completely unnecessary, dogs simply don't care about the color of their food. This dog food is made in the USA. This food includes Beef & Bone Meal, Animal Fat (BHA Used as Preservative), and Animal Digest. What all three of these ingredients have in common is that they are very intransparent. Which species is this meat and fat made of? You simply don’t know because all of them use unnamed animal sources. This product contains 2 controversial preservatives called BHA and Propylene Glycol. It’s good to know that ‍not all artificial preservatives are bad. That’s because they serve an important purpose, which is to prevent food from spoiling. However, we consider 11 artificial preservatives controversial because of their potential link to cancer and other serious health conditions. Unfortunately, two of them are added in this dog food. We find a whole host of artificial colors here. The food label shows Titanium Dioxide, Blue1, Red 40, Yellow 5, Yellow 6, Caramel Color. All of these are controversial and completely unnecessary in dog food - dogs are happy to eat food of any color. Please see above for a summary of each added artificial color. Besides artificial preservatives and colors, this food also includes an artificial flavor called Chicken Flavor. 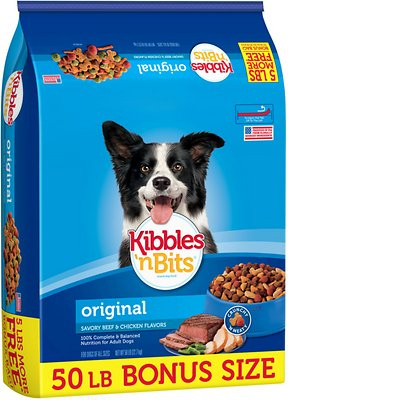 Kibbles 'n Bits has an average number of dog food recalls. Kibbles 'n Bits brand Dog Food; Chef's Choice Bistro Tender Cuts With Real Beef & Vegetables In Gravy; packaged in metal cans with Net Wt. 13.2 OZ; UPC: 7910052486A on flat case and 7910010375 on cans; Distr. by: Big Heart Pet Brands, San Francisco CA 94111. Kibbles 'n Bits brand Dog Food; Chef's Choice Homestyle Tender Slices With Real Beef, Chicken & Vegetables in Gravy; packaged in metal cans with Net Wt. 13.2 OZ; UPC: 7910052489A on flat case and 7910010380 on cans; Distr. by: Big Heart Pet Brands, San Francisco CA 94111. Kibbles 'n Bits brand Dog Food; Chef's Choice Bistro Tender Cuts With Real Turkey, Bacon & Vegetables; packages in metal cans with Net Wt. 13.2 OZ; UPC: 7910052488A on flat case and 7910010378 on cans; Distr. by: Big Heart Pet Brands, San Francisco CA 94111. Kibbles 'n Bits 12 Can Variety Pack; containing 6 cans of Chef's Choice American Grill, Burger Dinner With Real Bacon & Cheese Bits In Gravy; and 6 cans of Chef's Choice Bistro, Tender Cuts With Real Turkey, Bacon & Vegetables In Gravy; packages in metal cans with 12 - 13.2 OZ cans per case; Total Net Wt 9 LB 14 OZ; Variety Pack paper box UPC: 7910027685; Distr By: Big Heart Pet Brands, San Francisco, CA 94111. These packages are not meant for individual can sales and are sold as a 12 can Variety Pack.. Kibbles 'n Bits 12 Can Variety Pack; containing 4 cans of Chef's Choice Bistro, Hearty Cuts with Real Beef, Chicken & Vegetables In Gravy; 4 cans of Chef's Choice Homestyle, Meatballs & Pasta Dinner with Real Beef in Tomato Sauce; and 4 cans of Chef's Choice Bistro, Bistro Tender Cuts With Real Turkey, Bacon & Vegetables in Gravy; packaged in metal cans with 12 - 13.2 OZ Cans per case; Total Net Wt 9 LB 14 OZ; Variety Pack paper box UPC: 7910027750; Distr By: Big Heart Pet Brands, San Francisco, CA 94111. These packages are not meant for individual can sales and are sold as a 12 can Variety Pack.. Kibbles 'n Bits 12 Can Variety Pack; Chef's Choice Bistro, containing 4 cans of Hearty Cuts with Real Beef, Chicken & Vegetables In Gravy; Chef's Choice Homestyle, 4 cans of Meatballs & Pasta Dinner with Real Beef in Tomato Sauce; Chef's Choice Bistro, and 4 cans of Bistro Tender Cuts With Real Turkey, Bacon & Vegetables in Gravy; packaged in metal cans with 12 - 13.2 OZ Cans per case; Total Net Wt 9 LB 14 OZ; Variety Pack paper box UPC: 7910027750; Distr By: Big Heart Pet Brands, San Francisco, CA 94111. These packages are not meant for individual can sales and are sold as a 12 can Variety Pack. A TV station notified the firm and stated that certain varieties of their canned pet food products may contain Pentobarbital in low levels. The firm performed a safety assessment and concluded that no threat to pet safety was present. The firm agreed to conduct a product withdrawal, but the FDA considered this to be a recall once data indicated that the tallow was contaminated with pentobarbital. Gravy Train™ [Kibbles 'n Bits] products are manufactured by The J.M. Smucker Company, where a veterinary nutritionist is on staff. At The J.M. Smucker Company, quality products begin with quality ingredients. A dedicated team formulates Gravy Train™ [Kibbles 'n Bits] products to ensure they are nutritionally complete and balanced. Some teams involved include Research and Development, Quality Assurance and Marketing. Our products are produced to be nutritionally complete and balanced, and products are labeled in accordance with all applicable laws and regulations. In addition, our team works with veterinarians to provide the information they need to make the right dietary choice for the animal in their care. The specific names of the professionals working on the product were not provided.